What is an EAP (Employee Assistance Program) & How Does It Work? An Employee Assistance Program (EAP) is a confidential workplace service that employers pay for. An EAP helps employees deal with work-life stressors, family issues, financial concerns, relationship problems, and even drug or legal concerns. It is often available to both employees and their families to help workers remain productive at work. An EAP helps employers because it makes for happier employees. Employees have a confidential place to go with their personal problems. It also helps employees deal with stressors — from drug abuse to legal problems — so they don’t carry over into the workplace. To offer an employee benefit like an EAP program, consider signing up for a Professional Employer Organization (PEO). ADP TotalSource is a PEO that offers HR administration, talent management, employee benefits, payroll, and regulatory compliance, all in one package. Click on the button below for a free quote. Most EAPs provide a set number of counselling referral sessions, from 1-3, at no cost to the employee to fully assess the issue before recommending a resource, therapist, or service to the employee. The EAP does not do long-term counseling, but can help the employee get the ball rolling. 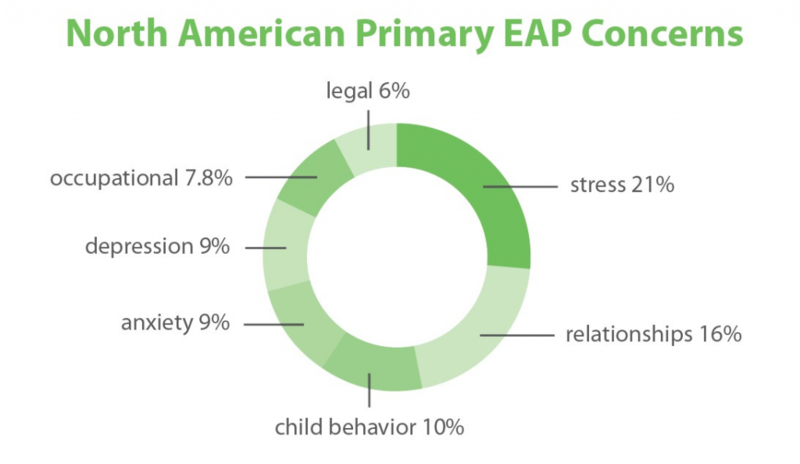 CompEAP reports that Employee Assistance Program (EAP) Services were provided by 93% of large employers and 74% of all employers in 2012 (up from 46% in 2005). A 2016 SHRM report showed the number to be 77%, in other words, more employers are offering EAPs over time. Likely due to cost, smaller businesses with 25 or fewer employer are less likely to offer an EAP. It’s also possible that smaller employers, without an HR department, are not aware of EAP services as a benefit offering, or don’t know how to set one up. Left untreated in the workplace, issues like anxiety, family problems or drug abuse translate into poor performance, missed work, bad customer service and workplace injuries that may cost you in terms of disability and workers compensation. An EAP is designed to give employees the help they need to resolve all kinds of issues, so they can remain on-the-job and productive. Based on a 2016 report by Medium, the image below shows the kinds of concerns employees are most likely to seek help for. Offering an EAP should cost you about $35 a year per employee. However prices vary greatly depending on your location, and whether it’s a pay-per-use program or you pay a fixed rate per employee. Thus, the range can be anywhere from $10-$100 a year per employee. Typically, larger employers pay a lower per employee rate than smaller companies as you can see in this chart below, based on EAP rates in Washington DC. In addition, an article by Fully Effective Employers, suggests that some EAP services are free – but you get what you pay for. For example, free EAP counseling might be offered by your local college’s counseling education master’s or doctorate program, but you’ll likely get grad-students as counselors. They may not have a lot of experience dealing with more serious issues like drug addiction. Shortlister, a benefits consulting firm, provides a list of the top 20 EAP providers in the US. SHRM’s vendor directory lists 43 EAP providers. International EAP Association, EAPA, which is a trade organization for EAP providers can also connect you to a local EAP provider if you call them at 703-387-1000. Another option is to search the internet for an ‘employee assistance program’ in your city. However, the best way for a small business to offer an EAP is to work with a PEO like ADP TotalSource. ADP TotalSource offers an EAP as part of a larger benefits program to help you easily and accurately deduct employer contributions. Click here for a free quote. Some employers wait to provide an EAP until a major event, such as a workplace death, a business buy out, or even a weather disaster such as a flood or tornado — to help employees cope. Other employers are more proactive and realize that personal issues can seep into and negatively impact someone’s productivity at work. In fact, EASNA reports that 1 in 4 adults have an untreated mental disorder, while 1 in 8 may have an addiction problem. Offering an EAP isn’t going to do much good for you or your employees, unless you explain how it works. You’ll need to provide training to educate them on what an EAP program is, how it works and how they can access services. The biggest fear employees might have is a concern that somehow you will know what they talk to the counselor about, or that they will get fired if you somehow find out they have a mental health or addiction problem. Employees will have many questions once you launch your EAP. It may take several reassurances to convince them to trust the EAP program. Here are common questions they may have and sample responses. A best practice is to create a flyer or handout with the name of the EAP, the contact phone number, and information on what kinds of services the EAP provides. Then offer a short training session to educate them on the EAP. Make sure employees know that EAP counselors maintain strict confidentiality, and they only report basic information back to the employer such as number and types of referrals/contacts. No specific employee information is shared. The smallest employers may have trouble convincing employees that an EAP is confidential. That’s because the employer will typically get a report from the EAP showing demographic data such as the number of employees seeking services, what kinds of services they seek (financial, legal, mental health), what state they’re in, and the job level of employees seeking services (staff, manager, executive). At a large employer this data isn’t a problem, but employees in a smaller company may fear that you will be able to deduce from the EAP reports, who is seeking services — especially if they’re the only person in a given ‘state’ with a ‘manager-level’ job. An EAP is a super program that pays for itself by keeping employee drama and an employees’ personal and interpersonal issues under control. That benefits your workplace, saves you time, and may save you money in reduced worker’s comp and turnover. It’s a benefit many employees appreciate, but may never think to ask for. However, if you offer an EAP, make sure you take the time to explain it’s confidentiality to your employees, so they’re not afraid to use it. Don’t forget to check out ADP TotalSource, a PEO that offers your employees Fortune 500-caliber benefits packages including EAP programs.